Be the first to share your favorite memory, photo or story of Samuel . This memorial page is dedicated for family, friends and future generations to celebrate the life of their loved one. 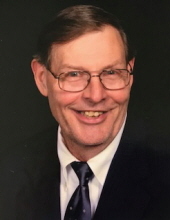 Samuel 'Sam' Clauson, age 70, of Stratford Specialty Care in Stratford and formerly of Boone, died Friday, July 6, 2018 at the home. Per his wishes, he has been cremated and a Memorial Service will be Tuesday, July 10, 2018 at 10:30 a.m., at the Schroeder-Reimers Memorial Chapel with Rev. King Smith officiating. Burial of his cremains will be in the Bass Point Cemetery north of Boone. Samuel 'Sam' Edward Clauson was born in St. Paul, Minnesota on March 31, 1948, the son of Rev. Ralph and Luellamae (Skarin) Clauson. He graduated from Boone High School in 1966. On January 19, 1973, Sam was united in marriage to Susan Kay Jones in Elk Point, South Dakota. He worked as a salesman and in the service department for over 35 years at Duffy’s Appliance in Boone. Then Sam worked for ISU Dining until his retirement in February of 2012. Sam was a past president of the Boone County Historical Society and coached and umpired in the Boone Little League. He had a love for history and enjoyed fishing, traveling and collecting stamps and postcards. Most of all, he had a great sense of humor and loved spending time with his family. He is preceded in death by his parents and brother, Daniel Clauson. Sam is survived by his wife, Susan, of Boone; daughter, SaLynn Lemke and fiancé, Bruce Conley, of Johnston; two sons, Scott and Greg Clauson both of Boone; five grandchildren, Allison and Emma Lemke and Chloe, Samantha and Owen Clauson; numerous nieces and nephews. Friends may call at the Schroeder-Reimers Memorial Chapel on Monday, July 9, 2018, from 4 until 8 p.m. where the family will be present from 5 until 8 p.m.
To send flowers or a remembrance gift to the family of Samuel 'Sam' Clauson, please visit our Tribute Store. Family will be present from 5 - 8 pm. "Email Address" would like to share the life celebration of Samuel 'Sam' Clauson. Click on the "link" to go to share a favorite memory or leave a condolence message for the family.